Can You Weld In The Rain? Electricity and water don’t usually mix. But is it possible to safely weld in the rain? The answer is a bit more complicated than you might think. Can you weld in the rain? Technically yes you can it’s not illegal to weld in the rain according to OSHA. But that doesn’t necessarily mean it’s a smart thing to do. Your risk of getting electrocuted while welding in an environment with high moisture is significantly higher. 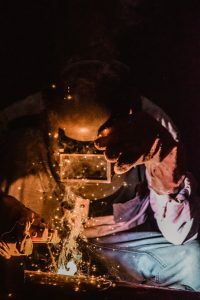 In this article we’ll look at the laws surrounding welding in the rain, and how to keep yourself safe if you absolutely must weld in the rain because of an emergency or urgent deadline. 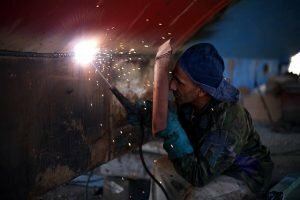 Is Welding In The Rain Illegal? Is it possible to weld in the rain? Ask an old welder. They’ll probably laugh and tell you that they’ve been doing it for the past 25 years! And they’ll usually follow it up with a story of a time that they were welding in a ditch with water up to their waist! Your first instinct would probably be that welding in the rain must be illegal. But then how do so many welders have stories about welding in the rain? Were they all breaking the law? To find out, we need to look at what the Occupational Safety and Health Administration (OSHA) has to say about it. The following OSHA standards apply to the use of electrical welding equipment: 29 CFR 1926.351, 1926.354, and 1926.406(c). None of these standards say that you aren’t allowed to use electrical (or arc) welding equipment in inclement (aka wet) weather. However, employers are required by Section 5(a)(1) of the Occupational Safety and Health Act, aka The General Duty Clause, to provide a place of employment that’s free of recognized hazards which could cause death or physical harm to their employees. Working with electrical equipment that’s in contact with moisture is recognized by OSHA as a hazard. So employers are required to address this electrocution risk. They might provide the employee with personal protective equipment like rubber boots and gloves, or they might cover the work area to prevent the welding equipment from getting wet. 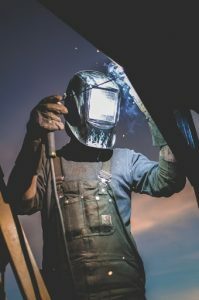 According to OSHA standards, it’s not illegal to weld in the rain, although employers have to provide reasonable protection for their employees. Of course, if you’re working at home with your own equipment, this doesn’t really apply to you anyway. Some companies will prohibit their employees from welding in inclement weather. But this is mostly for liability reasons, and they don’t actually have a legal responsibility to do so. So we know that welding in the rain isn’t technically illegal. But there is definitely still a higher risk associated with it. Welding in the rain puts you at a higher chance of getting electrocuted. Even if you aren’t personally harmed, the water could potentially ruin your welding equipment. But I get it. Sometimes there’s an emergency or you have a deadline to make, and stopping for a little rain isn’t really an option. If you absolutely have to weld in the rain, what safety measures should be taken to minimize the risk while doing it? It’s important to think smart and use your common sense when it comes to welding in wet conditions. Any type of moisture is hazardous for welders. Not just rain or snow are dangerous, but even your own sweat or working in a really humid environment. Your welding gear is specially designed to protect you from electricity. But if it gets wet, it becomes much less effective. Gloves. If your gloves start to get wet, either because of rain or sweat, you’ll probably start to feel your hands tingling just from holding a welding torch. It’s important to monitor your equipment, including your gloves, to make sure they aren’t getting wet. Or you could be in a lot of pain if you accidentally touch the electrode or arc. On hot summer days, it’s especially important to keep in mind, because you might be sweating away and not realize how moist your gloves are getting. Boots. Boots are crucial for a number of safety reasons, not least of which because they can protect you from getting electrocuted. Welding boots are made with rubber to help insulate you from the ground. But if they get wet, they become significantly less effective at that job. So don’t do any welding while standing in puddles, because it’s super important to keep your welding boots dry. Clothing. Just like gloves and boots, your clothing can also get damp with rain or sweat. In that case, your whole body is wrapped in moisture and just looking for trouble if a live electrode comes into contact with it. Basically, just always make sure that your gloves, boots, and clothes stay dry while welding. If anything you’re wearing gets damp while welding, stop until you’re dry again. 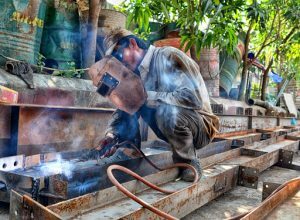 An oxyacetylene gas welder is the only type of welding machine that doesn’t use electricity. If you have to weld in wet conditions, it’s the safest way to go. Oxyacetylene welding uses a combination of oxygen and acetylene within a hand-held torch. This creates a flame with a temperature as high as 3,200 degrees Celcius, although it can be altered by adjusting the ratio of oxygen to acetylene gas. The flame of an oxy torch is much less intense than an arc, so it also has the advantage that only tinted goggles need to be worn while using one instead of a full welding mask. Inclement weather includes everything from rain to hurricanes. Each type of inclement weather brings its own risks if you’re welding outdoors. Whether you’re welding or not, it’s not very smart to be out in the open during a thunderstorm. Getting electrocuted by your welding machine is the least of your worries when you risk being struck by an exponentially stronger bolt of lightning. Storms come with other risks that might not be so obvious. Specifically, the wind that goes along with them. A strong wind can blow your shield gas away, which will make your welding arc unstable. It should go without saying that it’s not worth risking your life to weld in a tornado or hurricane! Q: Is it possible to weld underwater? A: Yes, scuba divers can use underwater welding to repair ships and other objects without having to take them out of the ocean. Welding underwater is possible but it must be done under very controlled conditions and using special equipment adapted to a marine environment with proper insulation. Q: What additional difficulties are faced when welding at high altitudes? A: Atmospheric pressure and low oxygen can make welding at high altitudes more difficult. Working at heights comes with its own unique safety risks as well. Q: Is welding a good career choice? A: The need for welders is expected to increase by 26% by 2020 according to the US Bureau of Labor Statistics. That makes it one of the quickest growing professions in America. Welders don’t need a college degree and can earn anywhere from $33,000 to well over $100,000. While welding in the rain is technically possible and not illegal, it’s still not recommended. There’s a good reason why every welding machine and manual comes with a warning sticker on it. Especially if you’re just working on a welding project at home, there’s no reason to take on the extra risk. It’s worth discontinuing your project if it starts raining. Turn off your equipment, get it out of the rain, and wait until the storm has passed before you resume your work. If you absolutely need to weld in the rain, make sure that you’re taking proper precautions. Ensure your gloves, clothing, and boots stay dry. If possible, cover the entire work area with a tarp or something similar to minimize moisture. You might also consider switching from an arc welder to an oxyacetylene welder during inclement weather as well. Have you ever welded in the rain, or do you know anyone who has done it? Leave us your feedback and comments below. PrevPrevious PostHow Can I Make Clean Plasma Cuts?